I adore art that gets handled, used, and even worn. Taking art off the wall and using it gives an extra dimension to the role of art making it more interactive. Art isn’t about creating something pretty to hang on the wall. 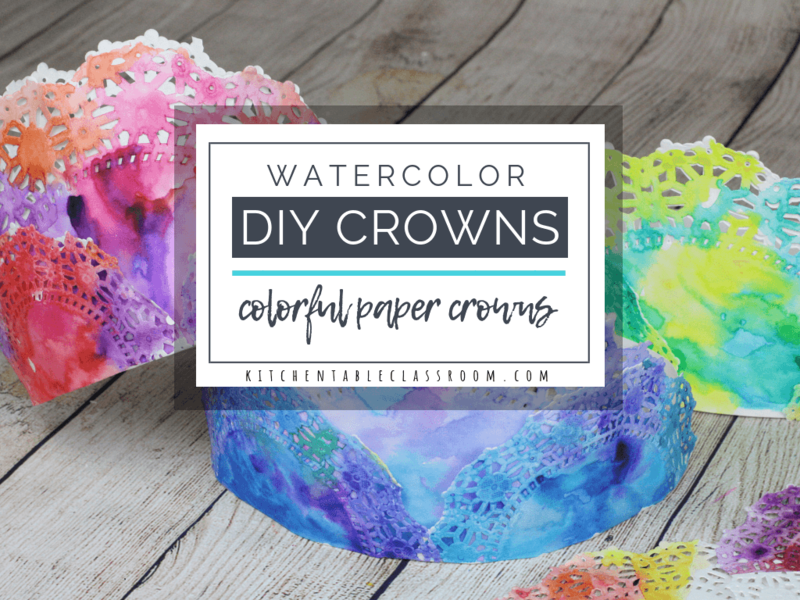 These painted crowns are perfect for costume play, a celebration, or a rainy day. The supply list for these painted crowns is pretty slim. You’ll need a variety of paper doilies. You can find these in the cake decorating department of any box store. 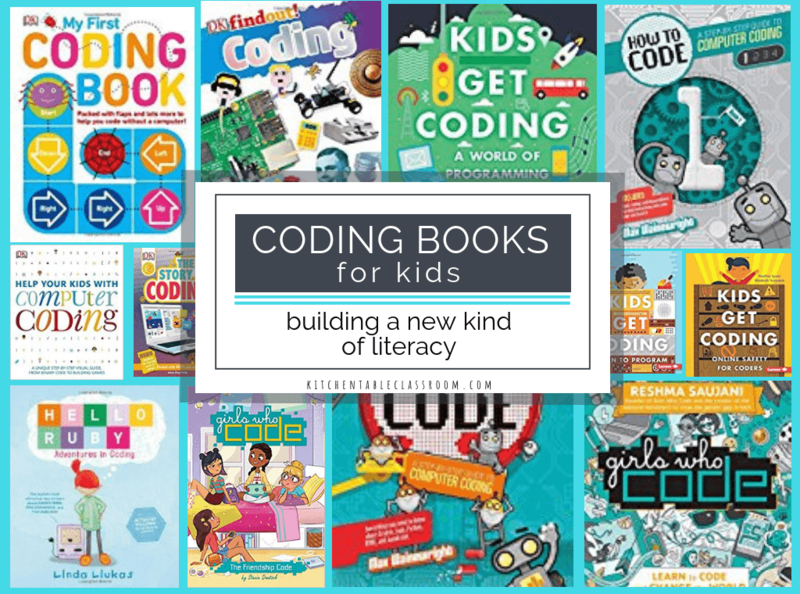 If you’re working with more than a few kids this assortment is way cheaper than any I’ve found in stores. The doilies add an element of detail and delicateness to these painted crowns but if you don’t have them- substitute! Trace around dinner plates and salad plates to create smaller and larger circles. 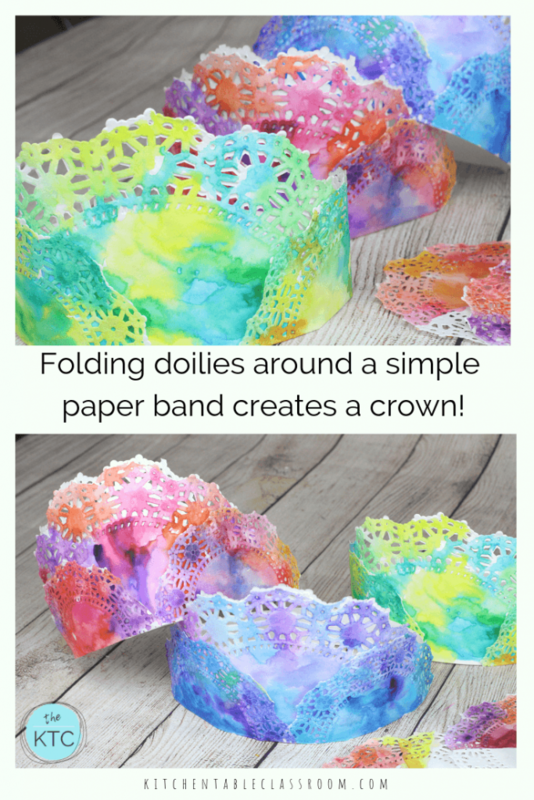 Fold those in half and create your painted crown in the same manner! You’ll also need watercolor paints. I typically use these Crayola watercolor paints for classes but recently splurged on this watercolor set for our house! 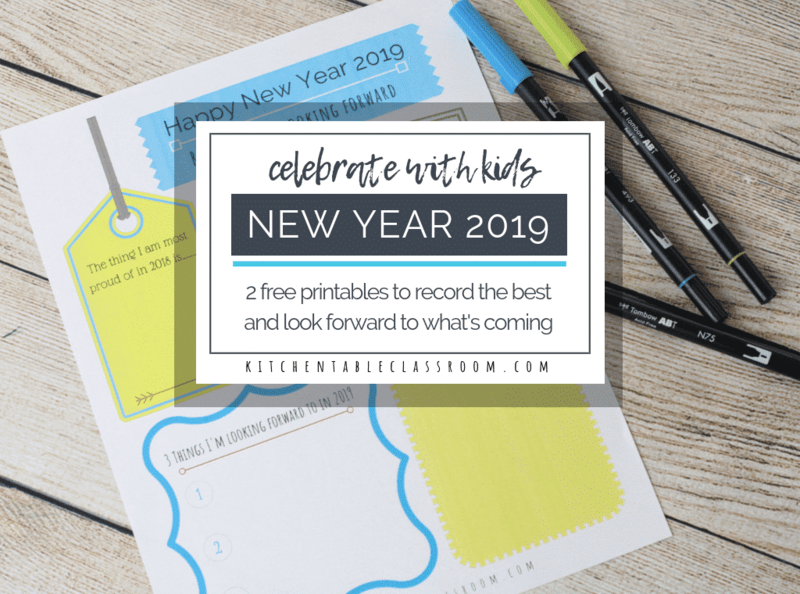 They create super bright and beautiful colors and aren’t too pricey to let the kids use! 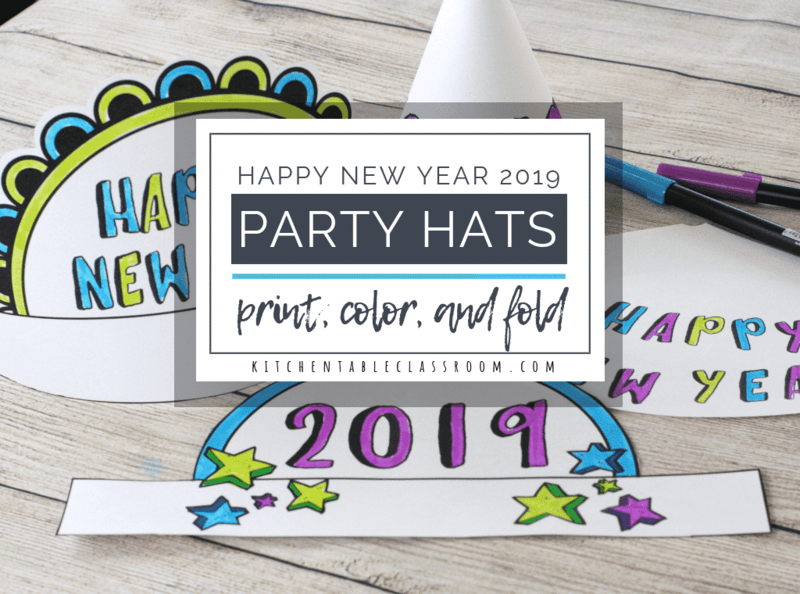 Scrap cardstock is perfect for creating the headband. You’ll also want to grab a glue stick for securing the doilies! We used three doilies for each paper crown- 1 large and two smaller ones. This formula isn’t set in stone. 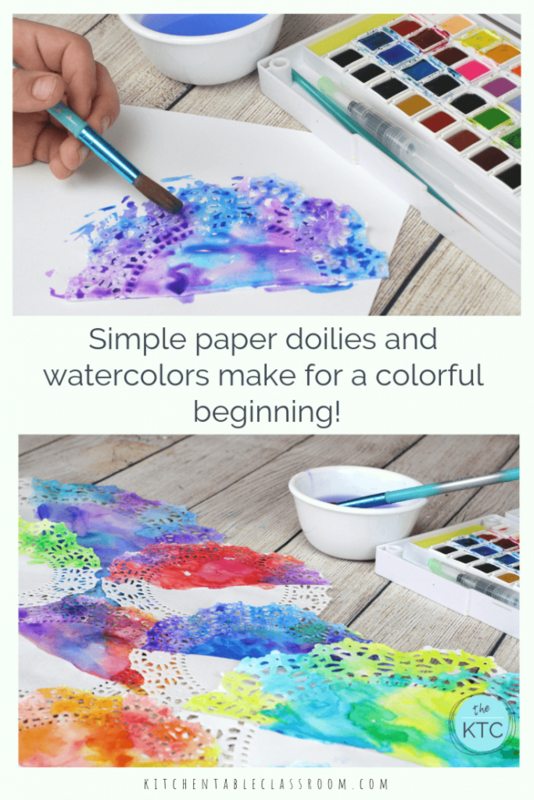 Use whatever amount and size of doilies your young artist loves. 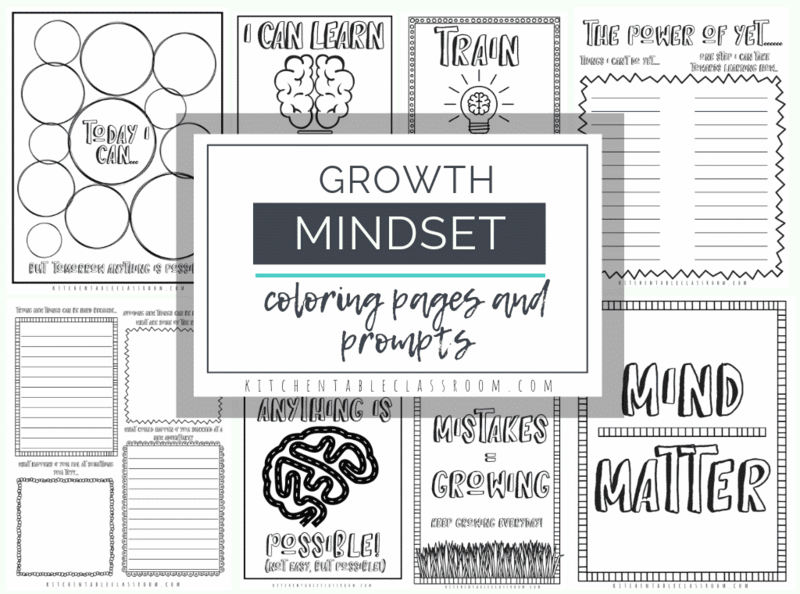 Set these aside to dry while you crate the headband portion of your painted crown! Cut a strip of tag board or cardstock about an inch and a half to two inches wide that is long enough to go around your child’s head. If you don’t have anything as sturdy as cardstock try rolling a piece of lighter weight paper so that you have several layers. Check and see that the headband will fit around your child’s head but don’t fasten it into a loop just yet. When the doilies are dry you’ll want to sandwich the headband in between the folded doily. 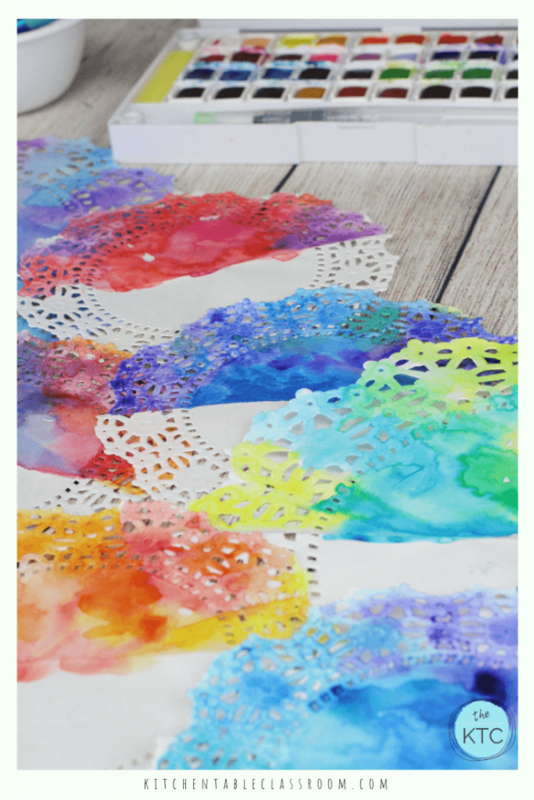 Use a glue stick to add glue to one side of the doily and fold it up. 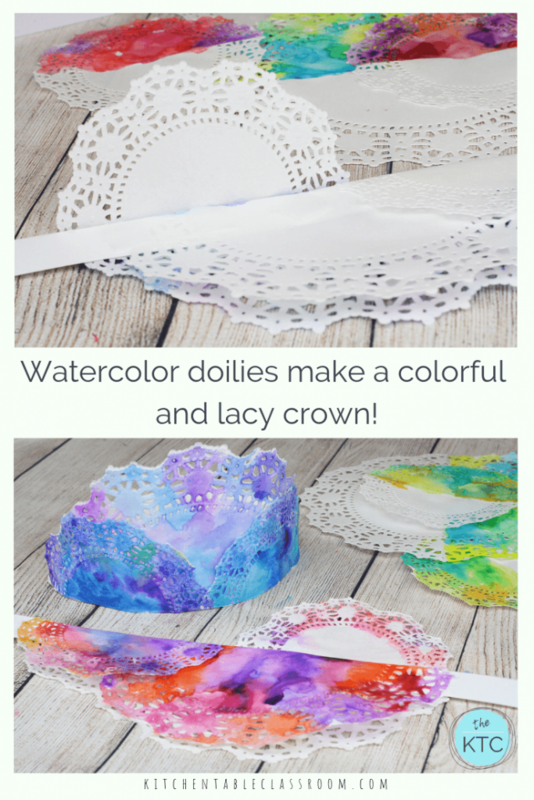 Layer any additional doilies in the same way! Once the doilies are dry and secure put the paper crown on your kiddo and measure it to fit. Secure with a piece of tape and set your kiddo free to be a princess or a knight or a fairy. 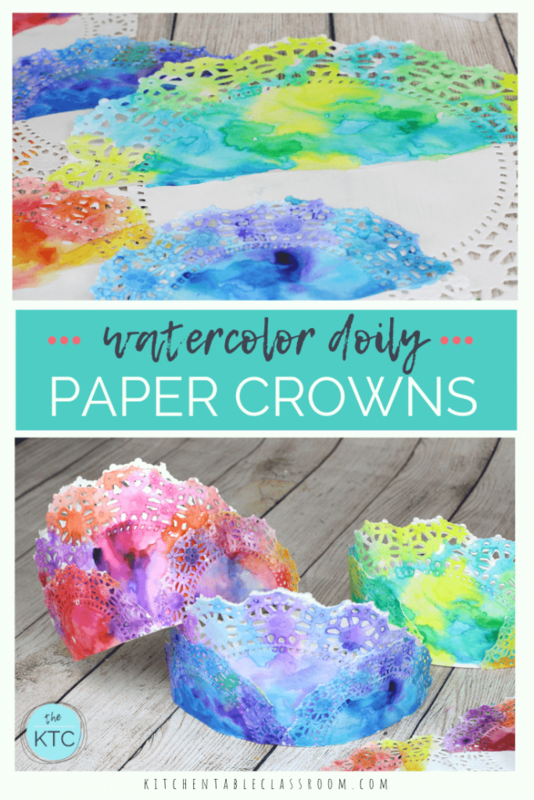 These colorful paper crowns are just the beginning of a day full of play, I just know it! 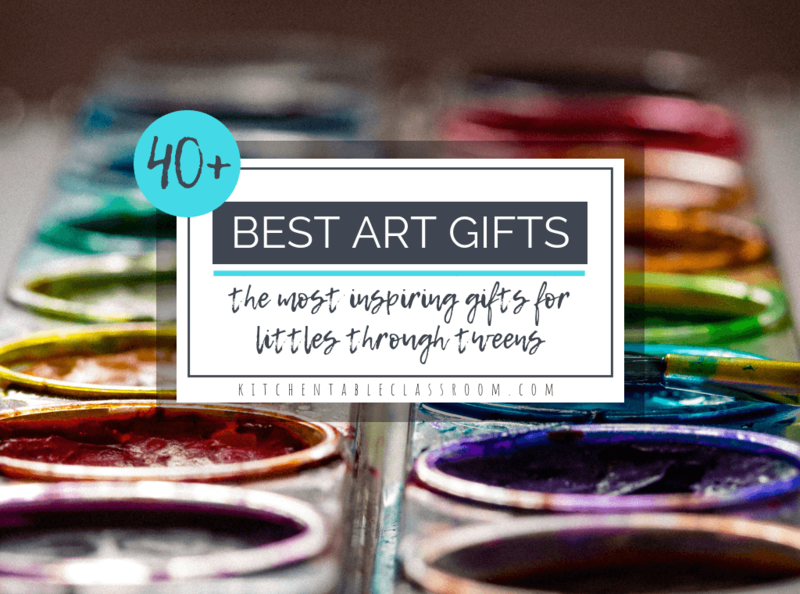 If your kiddo latches onto the idea of art that is a part of everyday life I’ve got some more ideas for you! After all art isn’t about making pretty pictures to hang above the couch. 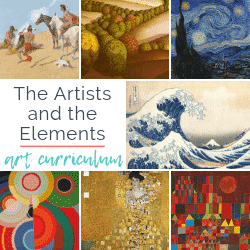 Teaching art to kids is about growing creative kids that know how to problem solve and use the arts as a form of expression! Art and creativity shouldn’t be saved for a special day! Make your own t-shirt with this crayon printing method. Kid’s love wearing something they made! Weave a bowl perfect for holding special treasures! Make your own coasters from 100% recycled materials! If you love these painted crowns I’d be so honored if you’d share them on your favorite social media channel. 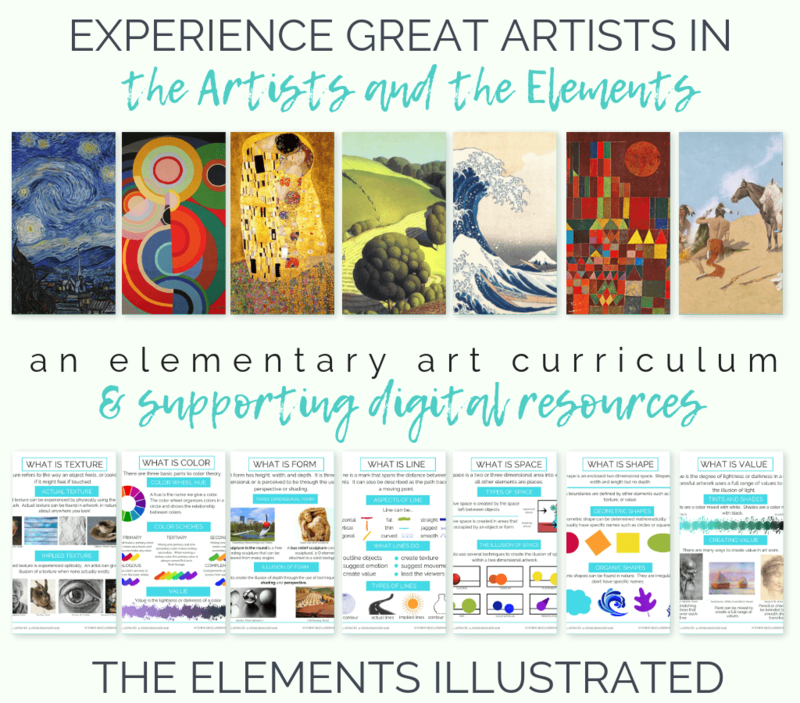 Each share gives me a a big boost and helps me to bring you more free resources and fun projects!